The 2-day meeting (6-7 February 2018) at the ECML in Graz, Austria, provided an excellent opportunity for the ECML project coordinators to discuss ongoing developments. The coordinators of 10 ongoing projects explored synergies between the different projects and exchanged good practice in methodology. They also discussed the development of their products and how to best disseminate the wide range of final results to be published over the next 18 months. They reflected on critical success factors in implementing, mediating, and maximising impact in the various national and individual contexts and shared initial ideas on both the contents and the structure of the next ECML programme (2020-2023). To conclude the meeting, the participants also highlighted the added value, both at professional and personal level, of coordinating ECML projects, seeing this as an opportunity to bridge policy, research and practice and contribute to making a real difference to quality language education in Europe. Ursula Newby, Chair of the ECML Governing Board and national representative for Austria, retired from her functions as General Manager of the Austrian Association at the end of January 2018. The ECML wishes to express its warmest thanks to Ursula for her ongoing support and dedicated commitment since first starting at the ECML in 1996. 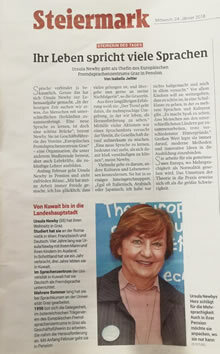 Among her many achievements Ursula has been responsible for initiating the Sprachennetzwerk Graz (Graz Language Network) and for launching the annual Sprachenfest (Language festival) around the European Day of Languages in Graz which attracts around 2000 visitors each year. Carrying on the excellent work from Ursula, the ECML is delighted to welcome Elisabeth Schlocker who takes up the torch as General Manager of the Austrian Association full of energy. Help pilot the "Developing language awareness in subject classes" teaching materials! Are you a subject teacher of 12/13 year old students with migration background and have an interest in collaborating with a European team in the development of teaching materials? Teachers who have agreed to pilot the project materials in schools will provide feedback on their experiences during the forthcoming network meeting (Graz, Austria, 18-19 October 2018). If you are interested in participating, please contact Marita Härmälä, project coordinator (marita.harmala@karvi.fi) for more information on how to get involved. Practical procedures that will help teachers to identify their learners’ language needs in the specific subject. The ECML publication "Language skills for successful subject learning" will serve as an important tool at this stage. Samples of language supportive teaching materials for 12/13-year-old learners in different subjects (e.g. mathematics, history, science) which show how different scaffolding techniques can help address the linguistic needs of learners including examples of the use of the European Language Portfolio as a tool to support the linguistic integration of L2 learners. A series of tools will be published on the working platform in order to be tested by the partner schools participating in the project. All resources from the schools that are published on the platform will be indexed with reference to a specific field within the EOL Matrix. A search engine based on educational level, theme and desired outcome will help finding resources. The network meeting (Graz, 20-21 March 2018) is designed to: familiarise participants with Council of Europe values, learning environments, language policies, and the project matrix; test the project tools; share practical examples; define strategies based on case studies; identify relevant resources; develop online training pathways for learning environments where modern languages flourish; as well as to enhance collaboration. Language for Work – a quick guide. How to help adult migrants develop work-related development of language skills is available in English on the project’s website. French and German editions will follow shortly with further languages also underway. Network members are invited to translate the Quick Guide into ‘their’ languages and disseminate it. If you can assist in the dissemination of this practical tool for professionals to support the linguistic integration of migrants, please contact the team at lfwnetwork@ecml.at for a template and any support needed. In addition to the Quick Guide, two other sets of guidelines for, respectively, decision-makers and staff in public services (including labour market administration) are ready in German. They aim at supporting social services to lower barriers when communicating with migrants. An English version will be ready soon. At the final project workshop (Graz, 23-24 October 2018) all tools which have been produced to advance practitioners’ professional development will be presented (Quick Guide, guidelines, ways to support work-related language development, overview of practitioner competences, resource centre). For more information, please contact the project team (lfwnetwork@ecml.at). E-Lang - Digital literacy for the teaching and learning of languages: pedagogical framework and training modules available soon! In the January-February 2018 issue of the ELTA Serbia Newsletter, Zorica Đukić reports on the e-LANG workshop on Digital Literacy that she attended on 10-11 October 2017. The event provided 40 language teachers, methodology professors, researchers and experts in digital didactics from 34 countries an opportunity to collaborate and to share their experiences and ideas on the topic. They were introduced to the concept of real-world tasks, to the pedagogical approach based on social interactions and to a draft version of the pedagogical framework which will be available for download in both English and French on the e-LANG project website at the beginning of 2018. Likewise, the first training modules will be freely accessible on Moodle for teachers interested in developing their digital literacy. Z. Đukić is an English language teacher, an educational advisor and a member of the Teaching Licence Board. As a member of the National English Language Teachers’ Association (ELTA), she has been working as a Newsletter and ELTA Journal co-editor, ELTA Serbia Board member, and ELTA Belgrade coordinator. The Pro-Sign II project is developing a professionally-oriented competency framework for sign language teachers and will provide B2 level materials and learning activities from different European sign languages. They will also create a European Language Portfolio (ELP) that takes account of any modality specific requirements for sign languages. The Pro-Sign team has been working in the following areas: aligning the Swiss German Sign Language curricula to the CEFR; piloting the European Language Portfolio with students in Ireland and in Germany. The data collected will help prepare the next Pro-Sign II network meeting (Graz, Austria, 5-6 April 2018). Project team members attended the VIth EALTA CEFR SIG in Dublin in January and delivered a CEFR workshop in Toronto in February. The 3rd Pro-Sign Conference (19-20 October 2018, University of Belgrade, Serbia) has already been announced. The call for papers and further details will be distributed soon. The website profils-langues.ch was launched in 2017 for foreign language teachers and student teachers to self-assess their language competences in the target language. Further insights from the piloting activities will feed into the CEFRLT project at the ECML. A validation exercise is planned on a parallel version of the existing Eaquals Framework for Language Teacher Training and Development that is aimed at teachers of languages for academic purposes working on courses intended for students in higher education. The overall structure of the future "Framework of reference for the training of teachers in the use of pluralistic approaches" should now be subject to only a few adjustments. Efforts will focus on the internal structure. The ECML is very grateful to the Association of the Deaf Teachers of Slovenia and the experts involved in this translation: Anja Kos and Franc Smrke (translators); Nataša Pavlović Cvrtila (language review); Marjetka Kulovec (review); and Petra Rezar (editor). Alan Dobson's article "Towards ‘MFL for all’ in England: a historical perspective” considers the provision of modern foreign languages (MFL) in the UK since the 1970s in the context of wider curricular change and also taking into account Europe-wide developments in MFL. Among others, the author reflects on the UK’s participation in Council of Europe and European Union projects and the extent to which MFL in England has been influenced by these. Specific reference is also made to the European Centre for Modern Languages (ECML). Alan Dobson is a former chair of the ECML Governing Board. The Language Learning Journal is edited by the Association for Language Learning (ALL) in the UK. On 2 March 2018 fifteen local organisers from Armenia, Bosnia and Herzegovina, the Czech Republic, Germany, Greece, Norway, Poland, Slovenia and “the former Yugoslav Republic of Macedonia” met ECML expert teams to prepare the next national training events in the areas of Plurilingual education and Online technology. The Professional Network Forum of the ECML is comprised of international associations and institutions that share common values and have overlapping expertise in the field of language education and assessment. Under the auspices of the ECML, the members of the Forum share their know-how and work together on areas of common interest in the service of language education. Members of the Forum: ACTFL, AILA, ALTE, CEL/ELC, CercleS, EALTA, EAQUALS, ECSPM, ECML/Council of Europe, EDiLiC, EFNIL, EPA, EUNIC, FIPLV, IAM, ICC, OLBI. The Multilingualism contest SWITCH 2018 was organised by the Province of Styria and the local school authorities. The event was held at the ECML premises on 6 March. Elisabeth Schlocker, General Manager of the Austrian Association for the ECML (Verein EFSZ), took part in the award ceremony and held a short welcoming address informing the audience about the ECML and the various options of visiting the Centre. The competition attracted more than 100 students from academic secondary schools (upper cycle) and higher-level technical and vocational colleges in Styria. The challenge for the candidates was to switch back and forth between two or three languages during an interview in front of a jury. The role-play required a high level of concentration and quick reactions, with sound knowledge of languages a basic requirement. The competition languages were English as the compulsory language, Croatian, French, Hungarian, Italian, Spanish, Russian, and for the very first time Slovenian. A big thank you to all participants and organisers and congratulations to the winners! Canada: registration open for the CCERBAL Conference 2018 "Translanguaging: Opportunities and challenges in a global world"
Registration is now open for the 2018 CCERBAL Conference organised by the Official Languages and Bilingualism Institute (OLBI) / Canadian Centre for Studies and Research on Bilingualism and Language Planning (CCERBAL). In its new ‘Strategy for strengthening of foreign languages in the national education system’ published in December, Denmark referred extensively to the cooperation with the European Centre for Modern Languages of the Council of Europe and its experience with the Common European Framework of Reference for Languages (CEFR). Follow CIEP+ on Twitter @ciep_plus to see the video presentation (1min30, pinned on their account). In 2018, the Délégation générale à la langue française et aux langues de France, in partnership with RFI, is offering a series of reports in the radio programme "La Danse des mots", covering five regional languages of France: Basque, Alsatian, Occitan, Breton and Corsican. Listen to the first programmes! Sites and publications in French and English to learn more about the French educational system. to enhance employer engagement in the development and use of trade languages. The vision that underlies Ireland’s education system is to "promote a society where the ability to learn and use at least one foreign language is taken for granted because of its inherent value for individuals, society and the economy". Terry Lamb chaired a discussion panel on community languages in schools at the Creative Multilingual Conference at the Institute of Education, University of Reading, earlier this year. On this occasion, he shared his insights into the role of community languages in schools and on how language learning can open minds. Terry Lamb is specialised in the field of languages and interdisciplinary pedagogy and language policy at national and international levels. He has most recently contributed to the work of the European Centre for Modern Languages (ECML) of the Council of Europe through the coordination of the joint ECML-EU initiative „Supporting multilingual classrooms“ which provides training workshops to assist member states of the ECML and the EU ensure access to quality education for learners from all linguistic backgrounds. The ECML is pleased to welcome Ms Kamila Sladkovská, Head of the Section Czech for Foreigners, National Institute for Education, as National Nominating Authority for the ECML in the Czech Republic, and Ms Emma Grainger, Strategic Initiatives Manager, Léargas, as National Contact Point in Ireland. The ECML would like to express its deepest gratitude to Ms Irena Mašková (Czech Republic) and to Ms Nellie Tattersall (Ireland) for their continuous support and wholehearted involvement in the respective roles during the last years. The implementation of the new programme of activities of the Education sector of the Council of Europe for 2018-2019 was launched by the Steering Committee for Education Policy and Practice (CDPPE) on 7 and 8 December 2017. The new programme is organized around three main clusters of activities related to the development of competences for life in democracy, the fostering of inclusive approaches in education, and the development of Ethics, Transparency and integrity in and through education. The Launching Conference “Building inclusive societies through enriching plurilingual and pluricultural education” is part of a series of activities to promote and plurilingual and pluricultural education and contribute improving learning and teaching languages with a special focus on The CEFR Companion Volume, as a complement to the existing Common European Framework of Reference for Languages: Learning, teaching, assessment. The Conference will be accompanied by parallel workshops where language education professionals and stakeholders will discuss implications, opportunities and challenges for language learning, teaching and assessment; develop recommendations and a road map for implementation; initiate constructive dialog. 180 experts across Europe and beyond took part in the Council of Europe webinar on “The CEFR companion volume and practical considerations for implementation” organised on 30 January as the first of a series of activities during 2018 to promote plurilingual and pluricultural education in the context of the 2018-2019 Education Programme of the Council of Europe. The CEFR Companion Volume results from a project of the Council of Europe’s Language Policy Programme to update the original illustrative scales of the Common European Framework of Reference for Languages: Learning, teaching, assessment (CEFR) with more descriptors. It also contains an introduction to the aims and main principles of the CEFR. The presentations can now be downloaded on the dedicated website. The recording of the webinar will be available online soon. On 1 March 1998, the European Charter for Regional or Minority Languages (ECRML) entered into force, becoming the only legally binding instrument worldwide dedicated to the protection and promotion of such languages. On 1 February 1998, the Framework Convention for the Protection of National Minorities (FCNM) entered into force as the first legally binding multilateral treaty on minority protection. In 20 years, the FCNM has contributed to diversity management in European societies: legislation on minority rights has been adopted, school curricula have been redesigned to provide space for languages spoken by persons belonging to minorities and new forms of minority participation have been established. The eLearning programme covers three dimensions of global education, Citizenship, Human Rights and Intercultural Dialogue. Their contents, topics, participation criteria and calendar are available on the specific eLearning webpage. The registration process is now open to apply for the course on the Intercultural dimension of Global Education which is scheduled from 2-29 April 2018. The next opportunity to take this course will be in Autumn (15 October – 10 November). You can access all information about this training on the dedicated webpage. Deadline for submitting applications: 28 March 2018. The campaign aims to highlight the commitment to democratic values and principles in the life and culture of schools across Europe and to support educators as they tackle controversial issues while promoting freedom of expression, inclusion and tolerance. The good practices highlighted in the campaign will reflect safe learning environments, free from any violence and fear, and the promotion of freedom of speech in schools. The campaign will be run by the Council of Europe in partnership with the European Wergeland Centre. Anti-rumours handbook to counter diversity-related prejudices and rumours. The handbook is accompanied by 5 tutorial videos. 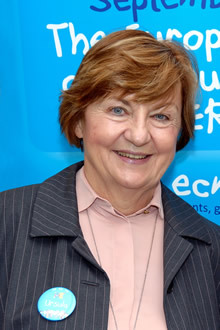 Since 2016, the Council of Europe intergovernmental project entitled “Digital Citizenship Education” aims to contribute to reshaping the role that education plays in enabling all children to acquire the competences they need as digital citizens to participate actively and responsibly in democratic society, whether offline or online. International Mother Language Day (IMLD) on 21 February 2018 - "Acting together for linguistic diversity and multilingualism"
UNESCO has celebrated International Mother Language Day for nearly 20 years now with the aim of preserving linguistic diversity and promoting mother tongue-based multilingual education. The 220 million Francophones worldwide celebrate their language and the diversity of the Francophonie, through word contests, shows, festivals, meetings, etc. The website www.20mars.francophonie.org lists the activities which are organised around this special day.